Investigators trying to determine what happened to Amelia Earhart more than 80 years ago now believe a newly discovered photograph shows she survived her final flight and was captured by the Japanese. "When you see the analysis that's been done, I think it leaves no doubt to the viewers," Shawn Henry, former executive assistant director for the FBI told NBC News. The photo, which was found in a former "top secret" file at the National Archives, is believed to have been taken in 1937, the same year the legendary pilot vanished during an attempted round-the-world flight. The photo shows a woman who resembles Earhart and a man who appears to be her navigator, Fred Noonan, on a dock in the Marshall Islands. The Japanese ship, the Koshu, can be seen in the background towing what investigators believe could be Earhart's Lockheed Electra plane. The photo was discovered by Les Kinney, a retired U.S. Treasury agent who has spent more than a decade searching for clues in the case. His work and Henry's analysis of it will be presented in the two-hour documentary Amelia Earhart: The Lost Evidence. 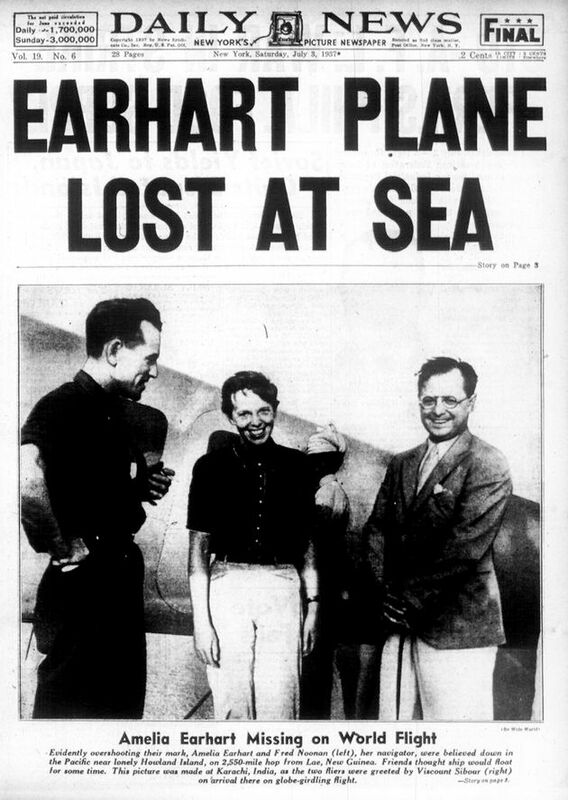 Kinney said the photo "clearly indicates that Earhart was captured by the Japanese." "It was misfiled," Kinney says of the photo in a clip from the documentary. "That's the only reason I was able to find it." Front page of the New York Daily News dated July 3, 1937. The experts believe the photo was taken by a spy before the pair of aviators were imprisoned in Saipan, where they ultimately died. Other researchers have speculated that Earhart did not die in a plane crash, but instead spent her final days surviving as a castaway on the island of Nikumaroro, Kiribati. As evidence of this theory, the International Group for Historic Aircraft Recovery told CNN last year that an unidentified skeleton found on the island in 1940 ― initially misidentified as male ― strongly resembled Earhart. However, no definitive identification has been made. Japan's Foreign Ministry, Defense Ministry and National Archives said they have no records of Earhart or Noonan being in their custody. However, many records from that time did not survive World War II, WTVJ News reported. The History Channel is running the documentary on July 9 at 9 p.m. ET.